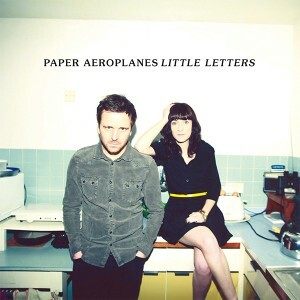 ‘Little Letters’ is the third album by Paper Aeroplanes. The Welsh duo (Sarah Howells and Richard Llewellyn) got together in 2009 and have been working hard touring and recording ever since. I'm not sure how you'd describe their music - it's a mix of Folk and Pop, so it's got the smooth polished sound of pop ballads with some of the feel of folk, and the lyrics are more folk than pop. It's a mix that works amazingly well and as a result this album is really listenable. The songs are fairly simple - primarily acoustic guitar and vocals, but by keeping things simple then they've avoided distracting the listener away from the lovely vocals and the lyrics. At times the vocals remind me of Cery Matthews from Catatonia - possibly it's the Welsh accent affecting the vocals and giving that similarity. The lyrics take their inspiration from a range of sources - title track 'When the windows shook' gets it's title and inspiration from when an explosion at a nearby oil refinery caused the windows in Sarah's house to shake. ‘Sleeper Train’ was written while Sarah was travelling from Xi’an to Bejiing in China. "It’s about falling for a friend in the UK via text message while travelling around China" she says. So you've got beautiful well written lyrics and music thats a blend of folk and pop. I think it's going to appeal to a lot of folk fans and should also attract new fans who wouldnt normally listen to folk. A great record that's well worth a listen. "Little Letters" is released on May 13 on Navigator Records.